Camolyze is a dedicated tool for HeadCam analysis of orienteering races and training for Windows computers. While other tools available either require Internet access (3DRerun, Attackpoint HeadCam analysis tool) or hours of data crunching (RGMapvideo), Camolyze can be used on your local computer without internet connection – for example at a training camp. This article demonstrates how you can use Camolyze for analyzing HeadCam videos synchronized with your GPS through a screencast. Below you see a demonstration video which shows how you get your training or event into Camolyze. The video goes through all steps required ; adjusting the route in QuickRoute, exporting map and route files, and opening video, map and route in Camolyze. Camolyze is still rough around the edges with some bugs and some missing error messages, but after you have used it one time or two you should be able to prepare an analysis in around 5 minutes after transferring the video file to your computer. Camolyze has the main features you need in order to do a good analysis of your race. 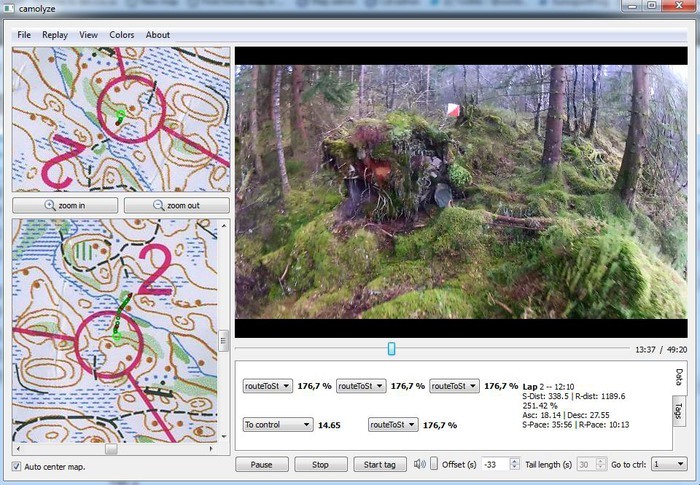 Map and video is synchronized – and thus you can easily get to any position in the course to look at a specific mistake. There are also possibilities to tag certain parts of the course to easily find back to key places in your race/training. Compared to the 3DRerun, Camolyze can be used offline and is therefore a clear winner if you are on a training camp without Internet connection. If you have an Internet connection – Camolyze and 3DRerun each have their advantages. Download Camolyze from the Camolyze webpage, unzip the file in some directory, and run the exe-file. You also need QuickRoute to utilize Camolyze. If your computer does not have the video codecs required, the video will not play – but no error message is given. This can be quite confusing for new users. If the correct fields are missing in the xml-file exported from QuickRoute, or if there is something wrong with your map image, you get no warning messages – it just doesn’t work. The video offset is saved when saving a video, but it is not applied when loading. Thus you must re-apply the offset after loading a video. It may take 15-20 seconds to open a new video/map – be patient! If you have used Camolyze, please tell about your experiences in the comments below.